WE HAVE THE MEATS. STEAK. BRISKET. CATERING. BEEF. IT'S REALLY GOOD! BUT DONT TAKE OUR WORD FOR IT. EAT MEAT WITH FRIENDS. FAMILY. ENEMIES. Your one stop shop for all things MEAT. RIBEYES, FILETS, STRIPS, RIBS, CHICKEN, PORK, SPECIALTY MEATS, AND CUSTOM BURGER BLENDS. The Shed Market serves only the highest quality meat! Prime Meat is a quality grade assigned by the U.S. Department of Agriculture to describe the highest quality beef regarding tenderness, juiciness, and flavor. This meat quality grade is awarded based on a combination of marbling and maturity. Therefore, the "prime grade" is given to meat that comes from the youngest beef with the most abundant marbling. All our pork is hand trimmed and packed to the industry's highest standards. Our pork is flavorful and juicy! Along with your favorite additions, you can smoke, grill, or bake for the perfect meal! Our Shed Market burger blend is a combination of choice chuck and prime brisket that tastes excellent cooked to any level of doneness. The Shed Market can custom blend burger patties to your exact specifications, allowing you to create your custom blend! All our chicken is moist, juicy, hormone free and full of flavor. Also, we offer Akaushi Beef from Heart Brand and Texas Waygu. After cooking for large groups of friends and family for many years and becoming well-known for their consistently high quality smoked meat and original recipes, Hollis and Betty Dean opened The Shed in Wingate, TX in 1989. The family farm the restaurant sits on has been in their family since the 1890s. The Shed was included on the Texas Monthly Top 50 list twice, in 1998 and 2002. Hollis and Betty worked full time in the restaurant from 1989-2005 when they decided to scale back a little. They continued to cater as well as raise cattle and run the farm after closing the restaurant. In 2013, Hollis and Betty’s oldest grandson, Byron and his wife Stacie bought the family farm and took over the catering business. As catering increased, it became more difficult for Byron and Stacie to cater on the side while working their other full-time jobs. 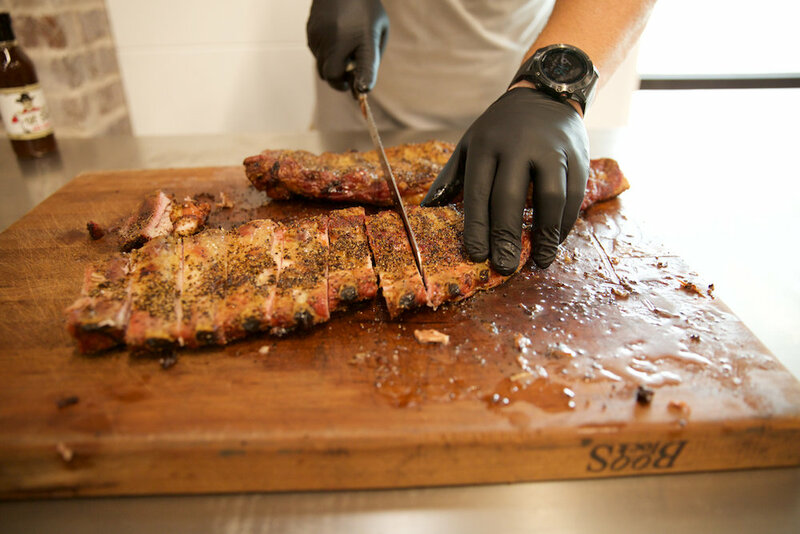 They are now blessed to operate The Shed Market together using the same BBQ recipes and standards they learned from Hollis and Betty, but have also added a custom meat market for the “foodies” of Abilene who enjoy preparing their high-quality meat at home. 11am — 6pm ( BBQ served until sellout ) Meat Market is open all day.